Well, look at Wimbledon, as they decide to allow Serena Williams into the top 32 seeds. The great player has won 23 Grand Slam titles. She had her first child last year, so she stopped playing for 13 months. She was thrilled and happy. However, when she returned in March, she needed to adjust, to take time, to be patient. As she has said, she needs to be keep steady and not think about losing. Here and there, over the past five months, she has been frustrated, but eventually, the 36-year-old will get better, month after month. However, Williams has not played a lot this season and right now, she is ranked No. 183. But the decision by Wimbledon to allow her higher — much higher — seeding. When they announced the seedings, Serena is ranked No. 25. In many respects, it is better than just handing out wild cards, as the tournament say ‘yes, no problem, come on in.’ A lot of tournament directors and/or owners do it all the time. Like for Maria Sharapova, for instance. Over the past year, Sharapova received a ton of wild cards at various tournaments, but she wasn’t given seeds until she cracked the top 30. Now she is seeded, No. 24 at Wimbledon. But Serena is not nothing. If Wimbledon is going to rank the top 32, let them go to it. It is not like she is coming back from nowhere. Whether to not Serena wins again, at least a number of people will go out to watch her on court. After all, she was the dominator, and she could be dominate on grass once again next week. Don’t complain about her, just watch her. FROM ROLAND GARROS — Once again, Rafa Nadal wins Roland Garros. He has now won 11 titles in Paris, and over the past 15 days, he was so clean, hitting deep and true. No one can touch him. 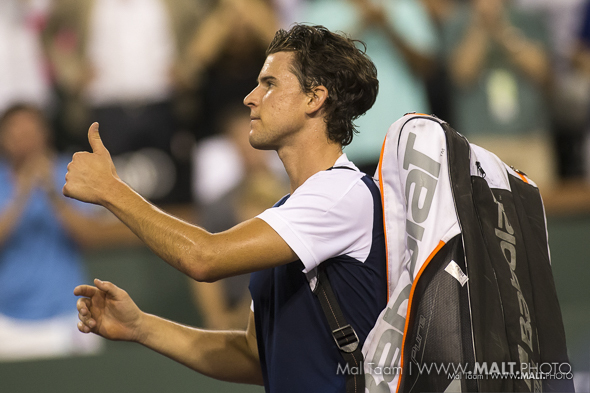 Austrian Dominic Thiem, tried as hard as he could, but there was no answer. Sure, during the moments, he looked sharp, going for the shots, hitting backhand to backhand, and when he had a small opportunity, he would go for it. But did Thiem managed to find the lines and hope that Nadal wouldn’t catch him? Here and there, but it didn’t work. Because Nadal is so fast, so patient, and he knows where the ball is coming from. The Spaniard’s forehand is massive, his serve is big, and at the net, today, he was almost perfect. His backhand has improved a lot over the last few years. Before, his backhand could be a little bit soft, or not deeper enough, but now, he is just fine hitting rallies, especially cracking down the line and putting it away. Nadal is just better on the clay courts, having 57 titles. That is more than extraordinary. Next year, assuming he is healthy, Nadal will be the favorite once again. How does anyone can really attack him at Roland Garros? On occasion, someone might win a set, but to win it three out of five sets? Right now, that is impossible. Thiem had a fine two weeks. He pushed himself, and he likes to add something new. However, he does have to learn even more. He can be erratic against the big boys. So, if he wants to win a major, he has to find the right strategy. If he does, sometime of the future, the 24-year-old will reach the final at 2019 RG. The No. 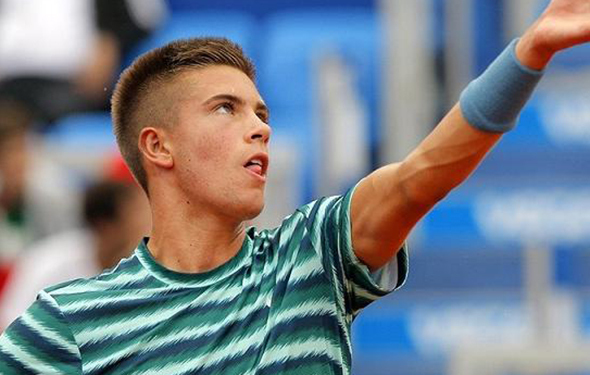 7 may not be able to upset Nadal, but on clay, Thiem could win the title against anyone else. He is that good. Nadal, A+: He only lost one set over seven matches, against Diego Schwartzman. Not bad, not bad at all. 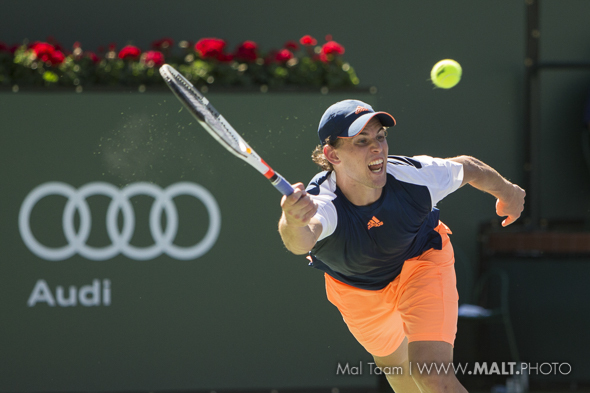 Thiem, A-: He has a wonderful backhand, and he likes to slide. Juan Martin del Potro, B+: The Argentine is pleased that now he can use the two-handed backhand more often, but the No. 4 can still get tired. Marco Cecchinato, B-: The Italian came from nowhere. Now there will be a lot of people watching after he stunned Novak Djokovic. Marin Cilic, B: The No. 5 finally likes clay and he reached the quarters, but DelPo wore him down. Novak Djokovic, B-: The 12-time GS champion looked pretty good early, but in the quarters, he made some key mistakes. And he was very angry. Alexander Zverev, B-: He won three, five-setters in a row, which was a heck of a lot of fun. But, his toes were raw, and he went down versus Thiem. The No. 3 needs to pick it up in the Slams. Simona Halep, A-: It took her many years to settle down, and she did, winning RG. Now the No. 1 will finally be calm inside. Sloane Stephens, A-: The American played amazing until the final, and in the first set, it looked like that she was ready to win a Slam again. But, in the last two sets, she folded it. However, mentally, on the clay, she improved a lot. Madison Keys, B+: The big hitter once again revamped on clay, and while she was spotty against Sloane, at least she is healthy again. Yulia Putintseva, B+: Many people think that she is not that good, but she practices all the times and she finally made the quarters, beating a number of good players. Maybe she can go even further this year. Garbine Muguruza, B: The Spaniard looked terrific, smashing Maria Sharapova. But in the semis, she lost it, and she fell against Halep. She is so good, but she doesn’t think enough. Angie Kerber, B: The German was playing terrific, fast and aggressive, but in the quarters, in the third set against Halep, she became injured and she collapsed. Maria Sharapova, B: A decent tournament for the former No. 1, but on court she gets anxious. She has to calm down. Daria Kasatkina, B: She looked formidable when she upset Caro Wozniacki, but then she lost easily to Stephens. She is very young though and she will continue to improve. FR0M ROLAND GARROS — Rafa Nadal is a pretty big favorite to win Roland Garros once again. He has won it 10 times, and he has never lost in the final, starting in 2005 when the teenager shocked the world. Last year, in 2017, he won it again. He was so locked in and so good. Dominic Thiem. He destroyed him. But now, the 24-year-old is a little bit more mature, he has improved his heavy backhand and his volleys at the net cords. He likes changing the tactics a lot, and he is fairly smart, so maybe, he can unearth Rada. Or maybe not. The thing is, the 32-year-old Nadal is brilliant when he is playing. He can be tricky, or he can attach very soon, blasting his forehand. He is very patient with his first serve, and when he manages to get into the net, he can jump up into the air, or he can bend down, grip it his racket, stare at it, and then decide where he could go. Many times, he puts it away. With his return, he stands way in the back, right near the fence, he quickly moves forward when the ball is struck and he pounds it deep. He doesn’t try to immediately hit a winner, he wants to start the points and then eventually, he will explode. But right now, while Nadal maintains his health — which is very rocly — he will continue to improve his backhand. Ten years ago, his backhand was so-so, it wasn’t going deep, but now he hits it deeper and harder. It is not perfect, and he probably never will be. But that’s because his forehand is gigantic, all the time. Plus, he gets everything.So what about Thiem? For sure, over the past five years, he has gradually improved, and he loves the clay. He likes to punch it out, and he likes long rallies, when he moves forward inch by inch until he can touch the line. His one-handed backhand is fantastic. He by slices and spins it, by flatting in out and smacking the ball for a winner. His forehand is heavy, and he can move it around.Yes, he has beaten Nadal three times, on clay, but Rafa has won five times, twice at Roland Garros. The Spaniard hasn’t lost a set to Thiem in Paris. After she lost the first set 6-3, and she was broken, 1-2, Simona Halep blew up quickly. The last time at three finals at the Slams, she went down. But this time, she didn’t panic, she kept running, getting the balls back constantly, pretty deep and hard. She ran and ran, she just kept striking. Halep won it all, out-hitting Sloane Stephens 3-6 6-4 6-1. In the fourth game in the third, she and Stephens were at the net, twisting around, bending down, and finally, Halep went in the air, with her back behind her, and she put it away. That was a tremendous point. After that, she pumped her first, while Stephens put her head down. It was over. The No. 1 Halep knew that she was going to win. She did, and she is still grinning, her first major. 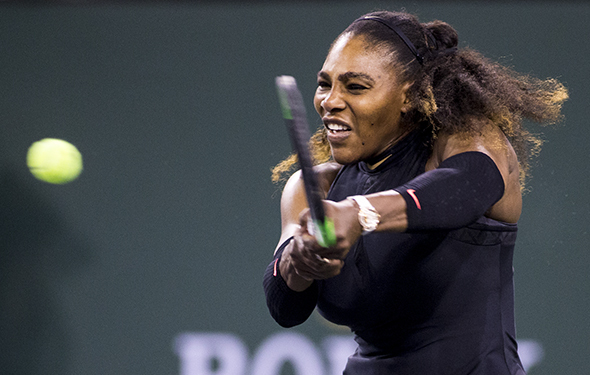 Whether she wins another Slam — and she really could — at least on Saturday, she finally showed that she was spectacular, through and through. FROM ROLAND GARROS — A year ago, Sloane Stephens couldn’t play. She was injured and far from happy. But every day, she would go into the practice courts and rebuild. She couldn’t play the French Open, but three weeks later, she felt good enough and went to Wimbledon. Mentally, she wasn’t ready yet, but she didn’t care, she just wanted to compete. She lost in the first round at Wimbledon and in Washington. Then, in Toronto, she was feeling better, running around, hitting hard when she needed to. She was concentrating. She beat Petra Kvitova, Angie Kerber and Lucie Safarova before falling to Caro Wozniacki. In Cincinnati, the next week, she reached the semis again, beating Julia Goerges before losing against Simona Halep 6-2, 6-1. Stephens and Halep will face off again on Saturday here in the final. It could be a very long contest. Stephens is very tired, but still, she knows her strokes are solid, her first serve can be deadly, and she can hit it down the line, both sides. She won the 2017 US Open, for the first time. It wasn’t easy during those two weeks. In the quarters, she faced Anastasija Sevastova, and Stephens hung in there, even though she was a little bit off, winning it 7-6(4) in the third. In the semis, she faced against the seven-time Grand Slam champion Venus Williams, and once again, it was deep in the third set. Stephens wouldn’t go away and she grabbed it 7-5 in the third. In the final, against Madison Keys, the Californian Stephens played almost perfectly and she won it, her first major. After that, she did almost nothing during the fall. She was mentally fried. When she started again in January, she says that she was slightly injured. She needed to find a new way, again. Over the past 13 days, Stephens has been super consistent, but last week, she almost lost in the second round to Camila Giorgi, edging her 8-6 in the third. The American took a deep breath and raised her game. After that, she has been steady, and now, she has an opportunity, and she strikes within seconds. On Saturday, she may not play wonderful tennis, but she will be right there against Halep. No. 1 Halep is so close to winning a Grand Slam. Last year in Paris, she reached the final, it looked like she could do it, but Jelena Ostapenko stunned her in three sets. In 2014, in the final in the third set, it was 4-4, Halep versus Maria Sharapova. Halep backed up, Sharapova moved forward and the American/Russian won. Now can Halep finally step it up and grab it? Nobody knows. For some players, the prospect of finally winning a major is more of a brick wall than a yellow brick road. Ask Ivan Lendl, who dropped four finals before breaking through in Paris in 1984. Stephens is playing smart and consistent. She has slid through her matches easily, dropping only one set to Camila Giorgi. She should be fresh and ready to apply pressure on Halep, letting loose with her dynamite forehand when the court opens up. Halep has lost two sets so far, overcoming a hiccup first set in the first round against American Alison Riske. She also had to fight off Kerber but dispatched the German easily in the second and third sets. Garbine Muguruza was rolling through the draw until she rammed into Halep. Three important factors will be play tomorrow. First, Halep doesn’t seem to get tired, as she covers the court and the wide area outside the lines with real speed and determination. Second, she is playing with true aggression, looking for winners when she has the chance. The Romanian may be playing her best tennis ever. But, the biggest factor is simple: Halep’s time has come. This is her third RG final and she’s been through a lot of heartache, especially when she let Jelena Ostapenko bully her last year. So, look to Simona to win straight out, in two close but demanding sets. FROM ROLAND GARROS – Rafael Nadal played excellent ball on Thursday, beating down Diego Schwartzman 4-6, 6-3, 6-2. 6-2. He was mediocre during the first hour on Wednesday. Then, the rain came and they went home. When they returned, Nadal rose up. His forehand was huge, his serve and his return were heavy. He was in control again. Now Nadal will face against Juan Martin del Potro, who outlasted Marin Cilic in four grueling sets. DelPo is so intense now, and plus — and this is the most important about the Argentine — his two backhander is better all the time. A few years ago, he could only chip his one-hander, because over the past seven years, he had to go to deal with the doctors who led him to the surgery table — three times. He admits that here and there, his left arm and his shoulder could be sore, but at least at Roland Garros, his body looks very good. However, DelPo and Nadal will have to play again on Friday in the afternoon, about 24 hours after they won, so they should be OK for the first couple hours. But after that, Delpo might start getting tired. If so, Nadal will pound him. Before that, Dominic Thiem and Marco Cecchinato will face off. Clearly, Thiem is the favorite, but the Italian stunned Novak Djokovic, 6-3, 7-6(4), 1-6, 7-6(13). Cecchinato is really hungry, he is pretty fast and he can muscle up from the backcourt. Thiem has a tremendous spin, with slice, and he can bend down at the net and put it away. The Belgian has been here three times in the semis at RG. It is time for him to reach the final, but if Cecchinato gets into it early, he could shock Thiem. Sloane Stephens is so solid, she is thinking all the time, she changes her tactics, she cracks it, or she can spin it very deep. She beat her friend Madison Keys 6-4, 6-4, and now she has reached the final at RG. She will face Simona Halep, who out hit Garbine Muguruza 6-1, 6-4. At times, Halep will back off, but during the afternoon, she moves forward when she could and she would rip her backhand and forehand very deep, crosscourt, or straight, or down the middle. It was an amazingly performance. Whether the No. 1 Halep can finally win a major on Saturday, that is questionable, because she can be tense. Moreover, Stephens is super steady, and will go for it when she has to. On Friday, we will break it down on tennisreporters.net. FROM ROLAND GARROS — Simona Halep plays fantastic when she is driving and feeling very smart. Then, when she is close to winning a Grand Slam, she can get nervous and back off. The great thing on Wednesday, in the second and third set, she pushed herself from the backcourt, swinging away and bashing the ball. She beat Angie Kerber 6-7 6-3 6-2 and advanced into the semis. She will face Garbinw Muguruza, who powered past Maria Sharapova 61, 6-2. Halep is so quick, so fast, so steady. She hits with a lot of spin, and she can flatten it out, too, from both sides. She moves around her serves, and her first serve can touch the corners. At the net, when she stops and focuses, she reacts, quickly, then touch the ball converts winners. At times, it is very difficult for her. Other times, it is simple. Today, the two-time Grand Slam champion Kerber wasn’t crushing it, because allegedly, she was hurt. So all Halep had to do was to react, simple stuff, and win it. She did happily. Now she has to face Muguruza, who brutalized Sharapova. The Spaniard jumped on the Russian/American almost immediately. She was moving extremely well, blasting her first serve, whipping her forehand and flipping her backhand. Inside, she realized that four years ago, she wasn’t ready yet to threaten Sharapova, but now she thinks the she can run faster, hit harder and push her back. Sharapova will continue to get better this year, but still, she cannot try to attack her shots every time. Today, that was a big mistake. On Thursday, Muguruza will clash with Halep. Muscle time for both of them. Here is some good quotes by Sloane Stephens and Madison Keys from a story I wrote for Tennis.com. They like each other a lot, but as she said, when they walk on the court, it’s all focusing, rather than talking. FROM ROLAND GARROS — Alexander Zverev was physically done. When he woke up in the morning on Tuesday, he felt fresh. But, when he got on the court against Dominic Thiem, his legs were very heavy. In the first set he felt a muscle pull and he needed treatment on his left hamstring. The result? Thiem blasted him in three quick sets. Thiem has played great over the past 10 days and has a terrific chance to reach the final at RG. He is a fantastic mover and his one-handed backhand jumps off the court with a lot of spin. While Zverev won three wonderful five-setters, still, the No. 3 has yet to reach in the semis at a Grand Slam. He is an amazing player, but he has to improve his return, his patience, and most especially, his volleys. How about the Italian Marco Cecchinato, who stunned Novak Djokovic 6-3 7-6(4) 1-6 7-6(11)? Djokovic played pretty well, overall, but he missed a few key opportunities and Cecchinato was on fire towards the end, with his flashy backhand and forehand. Djokovic was ticked off and he said that he isn’t sure he will play Wimbledon. He was pretty distraught. There are times when you are down and out, and there are times when you wake up and smell the roses. Or in the tennis court, you smell the opportunity. In the third set, Diego Schwartzman began to scramble more, he hit deeper, and he could tell that Kevin Anderson was getting nervous, and hesitant, and a little bit scary. Schwartzman was down 1-6, 2-6, 4-5, and ka-boom, he rose up. He grabbed the third set, and in the fourth set, Anderson was there to do it again, but he fell back. But in the fifth set, his brain had wilted. Schwartzman beat Anderson 1-6, 2-6, 7-5, 7-6(0), 6-2. “It’s definitely one of the most emotional matches that I can say I have played,” said Schwartzman. No doubt, but he has to go up against Rafa Nadal. It is possible that Schwartzman can win a set, but I doubt it given that Nadal has beaten him all five times, and pretty easily. Hopefully, he has to find something, anything, because Nadal just keeps on pounding. FROM ROLAND GARROS — It is to bad that Serena Williams withdrew; her arms and her shoulders really hurt a lot, which is why she had to way goodbye. She will see the doctors in Paris tomorrow. Will she will recover, quickly, and play Wimbledon? She loves Wimbledon — she has won it seven times — so she will push herself as much as she can. Hurt, or not. Serena was supposed to play against Maria Sharapova. So the American/Russian didn’t have a chance to to attack Williams and test herself. Not this week, though, maybe in Wimbledon, or during the rest of the summer. They both hope so. Sharapova will face Garbine Muguruza, who also advanced when Lesia Tsurenko retired after just two games. That is too bad, because there are a lot of fans who come out to watch the tennis and when there are just a few people playing, maybe the fans won’t want to come anymore. There are too many injuries, year after year. On the women’s side, there were two other matches on Monday, and there were two blow outs: Simona Halep crushed Elise Mertens, and Angie Kerber whacked Caroline Garcia in straight sets. Yesterday, on the bottom half, all four matches were contested, and there were no three-setters. However, there was a fun contest with Daria Kasatkina and Caro Wozniacki. There were some incredible rallies, and Kasatkina outlasted her 7-6, 6-3. On Sunday and Monday, there was only one good match. Let’s hope on Tuesday, there will be some wonderful contests, maybe Sloane Stephens against Daria Kasatkina. That must go three sets, with two cage players. They will have a huge amount of long strokes. Whomever will worn her down, she will reach into the semis. Juan Martin del Potro is so incredibly confidence now. He bested John Isner 6-4, 6-4, 6-4, crushing his forehand, his big serve and he moved fairly well. He also scampers to the net and puts it away. Isner had a good nine days at RG. He knows that his gigantic serve and her massive forehand, and he hustles. But, for the past 10 years, he hasn’t been able to figure out how to be an effective returner. He can do it here and there, but this was on clay, which is slower, and softer, and he couldn’t break it against DelPo. Not once. Marin Ciclic needed five sets to push back Fabio Fognini. It was up-and-down for both of them, playing well, missing it, re-doing it, over-thinking. As Cilic said, it was “extremely tough mentally.” And how. On Wednesday, two of the excellent top 5 veterans will clash. Years ago, from Cilic and DelPo, they struggled on clay. Still, sometimes, they make too many errors. But here at RG, they are going exactly what they can do. They are almost a tossup, both of them have won the US Open — on hard courts. On clay, even thought they can nail their forehands, they have to return deep. FROM ROLAND GARROS — A long time ago, Juan Martin del Potro was rising hard and it looked like eventually he would become No. 1. In 2009, he reached the semis at Roland Garros, beating the grinder Tommy Robredo in the quarters. In the semis, he cracked the ball when he could, but Roger Federer was too much for him. However, after three months on the hard courts, DelPo leapt over Federer in the final at the US Open. In the fifth set, DelPo ate it up, hitting a forehand that may be the fastest up to that point or since. But that has been nine years ago. 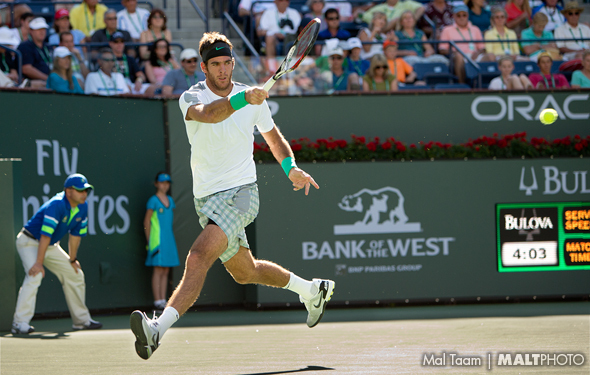 DelPo has been hurt for many, many years, but now, at least this week, he looks pretty good. He will never totally recover, but as long as he rests, and doesn’t overdo it, then he can stroll on the court and play super hard. Del Potro has to face John Isner, another big basher. They have played against each other 10 times, six wins by DelPo and four for Isner. Pretty close, no? since 2016 Isner has won three times and DelPo has won two. This season, Isner won the Miami Masters, knocking back DelPo 6-1, 7-6(2) in the semis. Are they even? Maybe, but the Argentine has won a Slam, so that it is extremely important. Isner hasn’t. The two have never played each other on the clay, so that should be more rallies, rather to have short points. You know, both of them can crush the first serves. Whoever wins, eventually, someone will have to face on Rafa Nadal. 6-1, 6-4, easy in the first set, but in the second, Keys had to be more consistent and focused. When it was 5-4, she sat down, took the towel, wiped it off, got up, took a deep breath and she was ready to hit some big serves. She did, close to the lines. Buzarnescu tried to bring it back, but it was too far away. Keys won and she is into the quarterfinals, the first time at RG. Sloane Stephens played fantastic on Sunday, destroying Anatt Kontaveit. Now she has reached the quarters at RG for the first time. The US Open champ has a legitimate chance to win it all, it she keeps pushing. … Marco Cecchinato upset David Goffin in four sets. Two days ago, Goffin stayed in there against Gael Monfils, saving four match points. He looked a little slow today and Cecchinato pushed him out.